Italy's star striker, Mario Balotelli, is a source of great confusion for fair-weather soccer fans on Twitter. Yes, Mario Balotelli (Italian soccer star, fashion icon, party boy) does have a very similar name to Mario Batali (TV chef, fashion laughin stock, party boy). 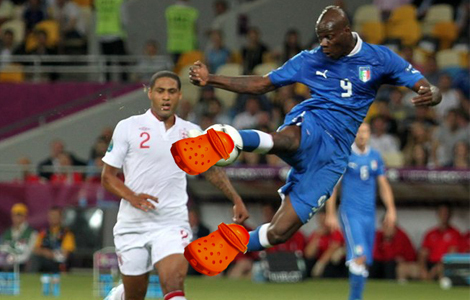 But the thought of Molto Mario ripping a volley into the top of the net in his signature orange Crocs is endlessly amusing—as is the notion of a mohawk-rocking Balotelli standing at the stove stirring a pot of marinara sauce. Many people are very confused by the notion that Mario Batali is playing in the World Cup (see also: the Internet is not very good at reading). Since both Batali and Balotelli are social-media rabble-rousers of the highest order, perhaps it’s only right that they have been conflated into one person by Twitter. Some users are clearly joking around about the mistaken identity, but others seem to genuinely believe that Batali plays for the Italian national team. I say, lost money on that one. I thought England could defeat Mario Batali in a game of footer, what what! Every time I hear about Mario Balotelli, I picture Mario Batali playing soccer. In his crocs.